Have you just unwrapped your new 4K TV only to find your old A/V receiver isn't compatible? Have you finally decided to pull the trigger on that dream home cinema you've always wanted? If so, I've found the best amplifiers for home theatres on the market. 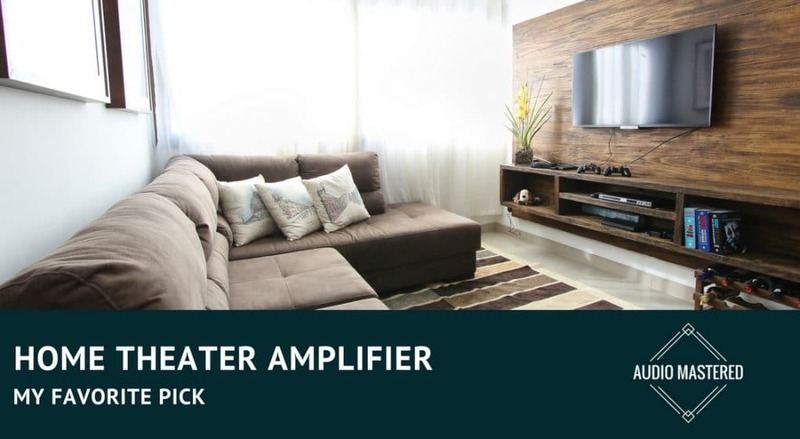 The amplifier is the brains on your home theatre sound system. One of the best ways to upgrade every aspect of your system is by upgrading the receiver. Modern receivers have come a long way in providing extensive audio and video processing and custom controls. Gone are the days of running wires to every corner of your room! I'll give a quick breakdown of some of the things you should be focusing on and then provide a few of the industry leaders. I'll cover some of the technical aspects while still keeping it accessible to the average home enthusiast. There are basically two different types of receivers: stereo and surround. Stereo receivers typically are less complex and are designed to control only two speakers at a time. Additionally, modern stereo amplifiers can usually control a subwoofer. They can usually be connected to other common devices such as smartphones and USB connections. My opinion is they are better suited for smaller setups in small rooms or offices. If you are wanted a more impressive setup you'll want to go with the A/V option (also referred to surround sound.) Home theater amplifiers can control multiple speakers and provide high-quality digital processing. Most audio companies have known for a while that most customers are going to base their decision on both specs as well as sound quality. Therefore, some lower-end companies have learned how to "cook the books" when it comes to the basic specs. Nevertheless, they still give a good first baseline of comparison. As a rule of thumb, the more power the better. More power doesn't just equate to more volume, it also gives you a clearer sound with less distortion. If your speakers provide a range of power options it's usually a good idea to shoot for the higher end of the spectrum. This usually provides the best sound with minimal distortion. How Many Channels Should We Shoot For? I usually recommend sticking with at least 7 different channels on your receiver. You'll need at least 5 channels to get full surround. Having an extra two channels gives you some flexibility as well as room to expand. You will also be able to play cutting-edge surround sound formats like Dolby Atmos and DTS:X. This is where things really get cool with speakers firing from the ceiling! I recommend at least 7 channels even if you are just starting out with stereo speakers. You'll don't want to limit yourself right off the bat. Here's a short video explaining a lot of these topics. Lots of TVs will now be connecting to your amplifier through HDMI connections. Pro tip: you need to make sure your receiver is HDCP 2.2 compatible. You may run into a few issues without it. Beyond HDMI there are a few other common connections you'll want to have. You will always be able to get away with RCA connections to your speakers. This has been the standard surround sound connection for the last few decades. Some TVs are starting to rely on optical outputs - just something to be aware of. Make sure you know your system connects before you purchase your receiver. As I mentioned above, there are now lots of options available for wireless connections. It's all going to depend on your room and if you're willing to route speaker cabling around your room. So What Is The Best Amplifier For Home Theater Systems? After spending a few days researching on audiophile forums I've finally found the winner. The one candidate that seemed to provide the best value per dollar was the Denon AVRS930H. The Denon pumps out 185 watts through each of the 7 channels. It's perfect for the modern streaming environment and comes with its own HEOS app. One feature that stood out for me was the ability to use Dolby Atmos and DTS:X 3D surround sound decoders, as well as all the latest video technologies including Dolby Vision, HDR (High Dynamic Range) and 4K Scaling. You really have to experience DTS:X to fully appreciate the difference from conventional surround sound. The multi-dimensional experience really takes your movies up a notch. I won't cover all of the features that are packed into the Denon, but just know that is does a fantastic job of what amplifiers are designed to do: provide that high-definition sound that takes your home theater to the next level. There are a ton of different amplifiers to choose from. The number of specs and minute differences can be mind-numbing. The only way you are going to land on the best is by either trying out a few for yourself or by spending days reading audiophile forums. The Denon was the one amplifier that repeated was recommend for those looking for a little more than a stereo setup. It's not exactly cheap, but you have to invest a little extra to get that theater experience we're all looking for. ​If you still are looking for speakers check out my review on the best soundbars here.